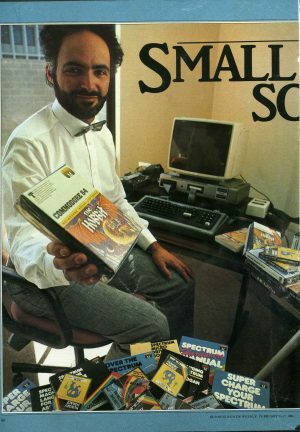 Alfred Milgrom co-founded Melbourne House publishing and Beam Software games development studio. Milgrom completed undergraduate science and then post-graduate studies in physical chemistry, at The University of Melbourne. It was there that he discovered an interest in computer programming, accessing the university’s giant “supercomputers’ after-hours to test and write programs. Through his student activities, Milgrom also became interested in publishing. In 1972, he started Outback Press with Morrie Schwartz, publishing Australian fiction. In 1978 Milgrom established Melbourne House with his wife Noami Besen in 1978 to address the changes in publishing rights between the US and Britain. Having a UK based business allowed them to acquire rights to publish US titles for both the Australian and and UK markets which was simpler and more cost effective than trying to acquire rights for just Australia. In the early 1980s inspired by an article on home computing he had read in “Australian Financial Review” Milgrom began to explore the new area of computer book publishing – writing and publishing “30 programs for the ZX80”. The book endorsed by Charles Sinclair sold well and Melbourne House went on to publish a series of books for the home computer market. With no established group of authors to draw upon for content for their books Melbourne House found themselves developing their own content – writing software games for publication – which inspired them to found Beam Software. Returning to Australia in 1980, Milgrom and Naomi Besen started Beam Software, the electronic gaming arm with distribution through Melbourne House. The name “BEAM” is an amalgam of their names. Beam became successful enough for Melbourne House to cease book publishing and to concentrate on electronic games. As director Milgrom took an active interest in all areas of Beam. Milgrom used his book publishing knowledge to secure permission to make a game based on J.R.R Tolkien’s book the “The Hobbit” which was to be a massively successful title for the studio. He produced all their early games and was responsible for the design of the inimitable Horace the hero of William Tang’s “Horace” series. Beams in house composer Neil Brennan recalls how Milgrom would suggest possible musical themes for the games and had him researching circus music for one game and traditional Chinese music for another. Beam’s composer also noted Milgrom’s preference for classical music whose copyright had expired. Games development was a fledgeling industry. Milgrom found Beam’s early staff through advertising for students from Melbourne University’s Computer Science degree. As the possibilities for developing games expanded he hired artists and composers for the studio, inventing roles as they were required. Many of the people that Milgrom hired in those early days went onto play a major role in the creation of the Australian games industry. Milgrom had a keen eye of the potential of the new technologies and the development of utilities was a significant part of his vision for Beam. In the 1980s the studio created some very impressive in-house software. Some of these like their fast loader, the Pavloader, were commercialised but mostly the utilities, their work on audio compression, format conversions, and later video compression remained in-house, with the plan of giving Beam an edge on other developers. Having been woken early to the fact that home computing was a very fast evolving environment, making it a risky business, Milgrom also kept a close on eye on hardware. The studio would build and hack systems and reverse engineer new platforms. On its release Milgrom brought a couple of Nintendo Famicoms from Japan. These were reverse engineered by Beam employee Adrian Thewlis. This allowed the studio to develop a set of instructions for developing for the NES. Whilst Nintendo Japan was at this time not interested in Beams attempt to develop for their platform. When Nintendo moved into America however this guide combined with some rather astute tactics by Milgrom let him persuade the infamously closed shop Nintendo to grant Beam a development licence. Beam’s staff of the 1980s remember, a sometimes barefoot, Milgrom as presiding over a collegiate, creative and informal work place. A motivated staff were encourage to pitch projects, develop new ideas and take their own initiative. The sale of Melbourne House to Mastertonic in 1987 however changed the way that Beam had to do business, they no longer had creative control over the games they wished to make and their production schedules. Milgrom remained with Beam Software, until 1999. In the mid 1990s he founded Smarty Pants Publishing creating educational software. Milgrom is currently director of Zazz.com.au a successful online retail site which offers a new technology product each day for 24 hours only.